These guys are one of the pioneers of indoor live-grill concept and our go-to place for scrumptious and meaty barbecue skewers and more. 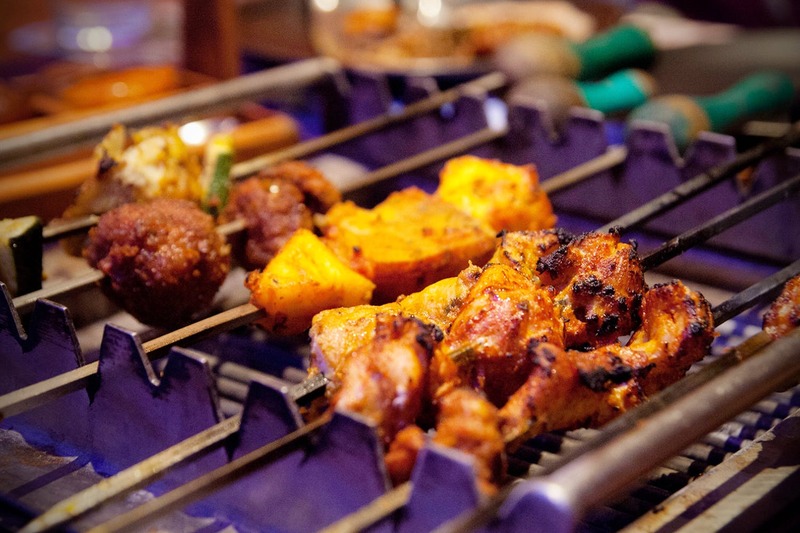 Step into any Barbeque Nation outlet and the sizzle of grills is what you will hear. You can order amazing starters including skewers and platters which include options like prawns, fish, chicken or mutton prepared in Peshawari, Lebanese, Indian, Mediterranean or even Chinese style. The starters for vegetarians aren’t limited to the usual paneer options, they have mushrooms, assorted mixed vegetables (and fruits) including pineapple skewers and the very popular Cajun Spicy Baby Potato Platter. We particularly love their spicy prawn barbecue along with a king-size seekh kebab platter cooked in Afghani style. They have both hot and cold options for desserts and a Live Kulfi Counter. Barbeque Nation has several outlets in Kolkata and they keep adding to the list. Hop in or book a table on their official website. Price For Two: INR 1,400.